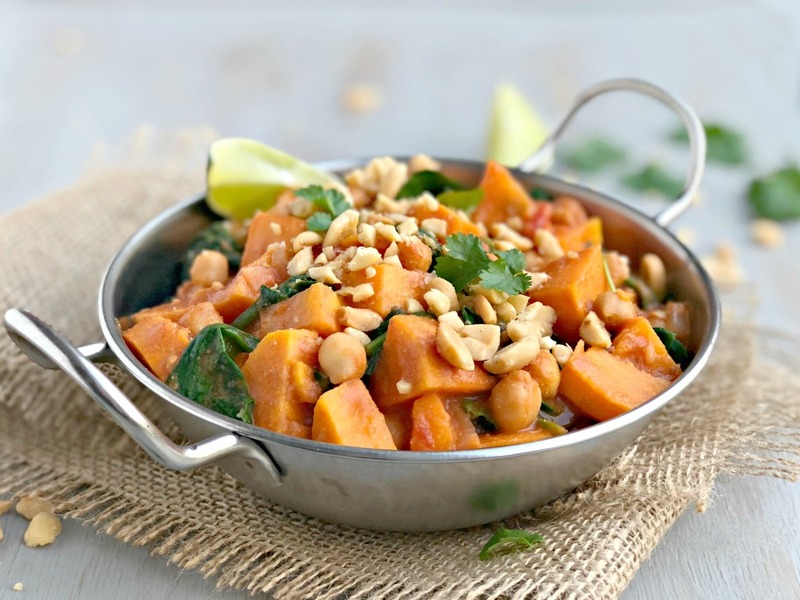 This sweet potato, spinach and peanut curry is one of my favourite vegan meals. It's easy, super healthy and really tasty. Peanut butter thickens the sauce as well as giving it a rich nutty flavour and chickpeas add protein. I use smooth peanut butter in the sauce and sprinkle over crunchy peanuts at the end to add texture. It's so delicious. The sweet potato curry tastes best when garnished with lots of fresh coriander and a squeeze of lime. It really lifts it. Fresh spinach is definitely best, but you can use frozen spinach - just defrost it well before use and give it a good squeeze before adding it to the pan. Heat the oil in a large saucepan and fry the chopped onion for about 5 minutes until soft. Add the garlic, ginger, chilli and dried spices and stir for about a minute. If it starts to stick add a tiny splash of boiling water. Add the diced sweet potato and stir fry for a few minutes to give them a little colour. Add the chickpes (if using) and tomatoes. Stir well and season to taste. Pour over enough stock to just cover the ingredients the pan (top up with boiling water if you don't have enough stock). Simmer for 10-15 minutes until the sweet potatoes are tender. Be careful not to overcook them as they will break up. Ladle some of the hot liquid from the pan into a bowl and add the peanut butter. Mix well to make a smooth paste and pour into the saucepan. Mix everything together well. The sauce will thicken. Taste and adjust seasoning if necessary. Finally wilt the spinach into the pan with the other ingredients and turn off the heat immediately. Serve over rice or couscous topped with lots of fresh coriander and some smashed up unsalted peanuts and lime wedges.